For his Eagle project, Sean McGinn organized and coordinated a children’s book drive to benefit the charity Reach Out and Read which distributes books to less fortunate children through their pediatricians to promote literacy. With the help of Camp Avenue Elementary School, he was able to collect well over 1,000 books. Sean Heverin undertook a project to beautify the 9/11 memorial at the Merrick train station. He raised funds to purchase plants and materials that were needed for the garden. Along with sixty volunteers, Sean helped clean the area of dead plants, weeds, and miscellaneous objects to put in plants, flowers and a stone walkway into the memorial. John McMullin, to attain the rank of Eagle Scout, constructed a cage for quails at a non-profit organization called Sweetbriar Nature Center. Sweetbriar has trails to walk on and has had concerns with ticks due to the wooded area. In order to combat the tick population, they release quails which eat ticks as a main source of food. John’s cage helps to protect the quails when they are young and is fitted with a heat lamp to help raise them as well. 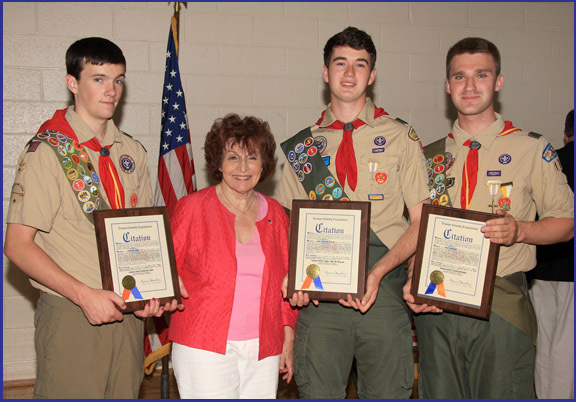 Pictured (l-r): Eagle Scout Sean McGinn, Presiding Officer Norma Gonsalves, Eagle Scouts John McMullin and Sean Heverin.